Happy New Year! Did you enjoy a little (or a lot) of indulgence over the holidays. 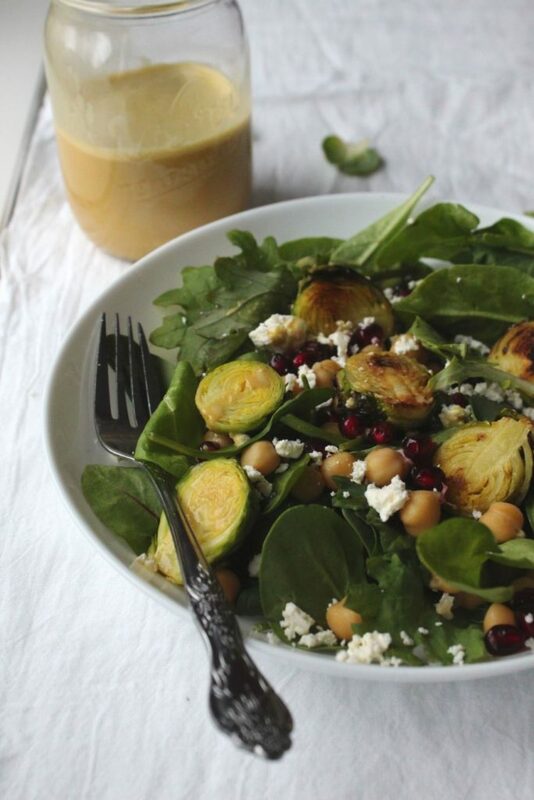 We did, but we are back in the swing of eating healthy with this spinach and chickpea salad with crispy brussels sprouts. How many of you want to improve your health in 2017? Healthy eating is one of the top New Year’s resolutions and one of most commonly broken resolution as well. While I like the idea of a fresh start, I am not a fan of New Years Resolutions. The times that I did attempt to make them, I think I forgot all about them by the end of the month. If you are looking for some realistic health tips for 2017 check out this latest post from huffington post. While, I am not one to make New Year’s resolutions I love to peruse Pinterest for endless healthy recipes. If you are looking for a new salad recipe I have a tasty nutrition packed spinach salad with crispy brussels sprouts. This hearty spinach and chickpea salad with crispy brussels sprouts is our new go to winter salad. I considered calling this salad” nutrition powerhouse” because all of the vegetables are essentially “nutrition powerhouses”. Brussels sprouts are high in fiber, potassium, folate, and 1 serving provides you with your daily vitamin C. Pomegranates are high in antioxidants and add protection against heart disease and certain types of cancers, as do the brussels sprouts. This salad is hearty enough own its own due to the chickpeas which are high in both fibre and protein. I buy my beans and lentils from a local company called grain. Just remember to cook them after soaking them, I made the mistake once and let’s just say they were a little crunchy. For extra flavour I added feta but if your vegan or don’t like feta you could easily hold it and/or add roasted pumpkin seeds instead. To finish this salad off I tossed it in glory bowl dressing from Whitewater cooks. 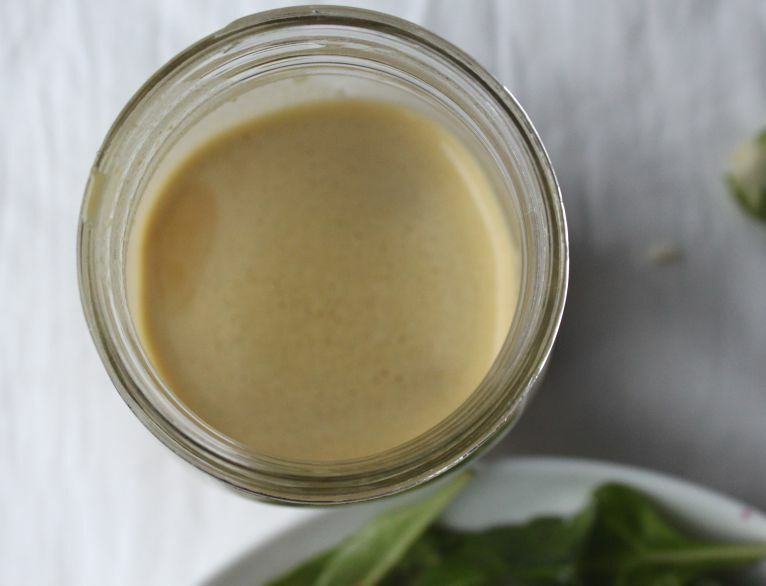 This dressing is so delicious and can be added to many different salads. To introduce my girls to salads I started serving them a small bowl, my five year old ate the salad before the rest of her meal and commented how “delicious” it was. I truly believe being a good role model is essential in creating healthy and adventurous eaters. Heat medium size pan with avocado oil, add brussels sprouts and pinch of salt. Sauté for approximately 7- 9 minutes until crispy. 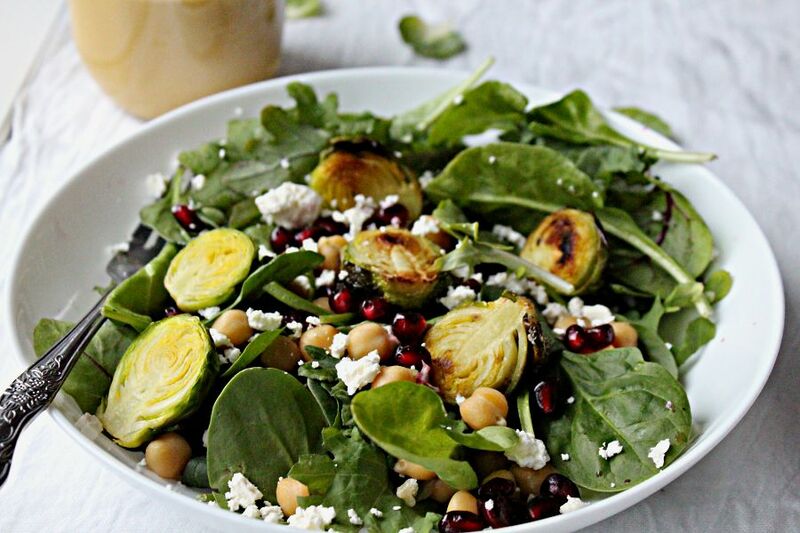 In a large bowl, combine spinach, chickpeas, brussels sprouts, pomegranate seeds. Place all salad dressing ingredients in blender and blend. You will have extra salad dressing. Place in a jar and keep in fridge for 2 weeks.